Happy Labor Day Weekend!!! During a holiday when you’re going to be surrounded by temptation, it’s always a good idea to bring a guiltless dish to share at that family party or barbecue. And who doesn’t love the taste of a good Caesar salad? It’s crunchy enough to make you feel like you’re having a nutritious meal but has a whole lot of creamy decadence. 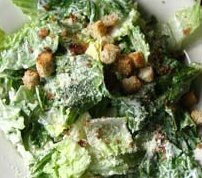 Unfortunately, conventional Caesar salads are full of mucus-forming dairy, high sodium, and gluten-filled croutons. Yuk! Here’s an alternative that I like to make when I’ve really got a creamy craving. Whisk or blend tahini, lemon, olive oil, namu shoya/gluten-free tamari, and a drop of stevia. Mix pine nuts, garlic, and sea salt in a food processor. Mix in all ingredients, making sure the dressing touches all parts. Add the nut cheese on top for taste. Enjoy!